Save even more when you purchase a 4-Piece or 5-Piece Set! Grand Bahama Flotation Group with Fast Free Shipping! 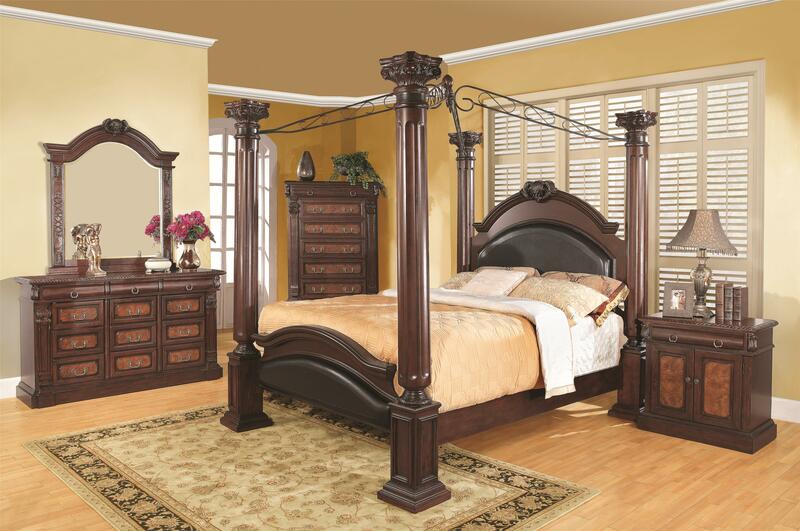 Make a grand statement with this poster bed with upholstered panels, large posts and black metal scrolled top. Pine solids and cherry veneers. The flotation system includes: bed, mattress, and foundation. Matching furniture available separately or as a 4-piece or 5-piece set. 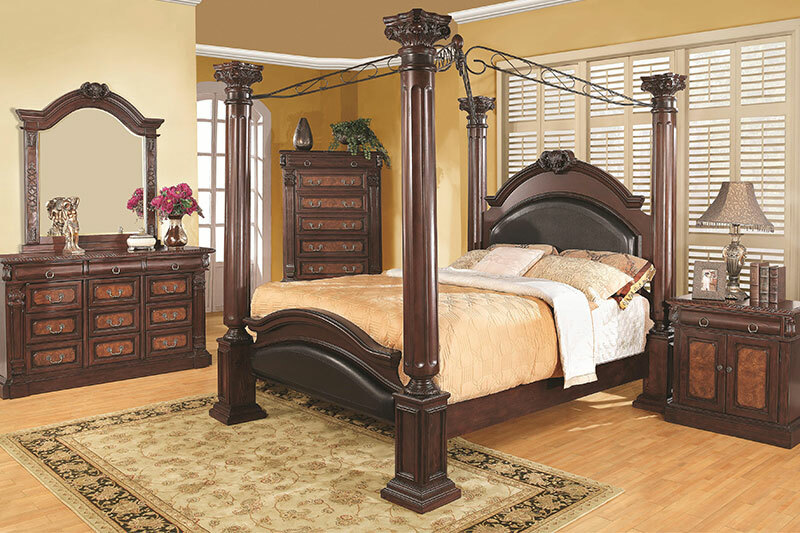 Make a grand statement with this poster bed with upholstered panels, large posts and black metal scrolled top. Pine solids and cherry veneers. The flotation system includes: bed, mattress, and foundation. Matching furniture available. Available in Queen, King and California King sizes. The Grand Bahama Flotation System includes: Bed with Headboard Sideboards, & Footboard, 8" deep plush-top soft side mattress and matching foundation for a complete modern flotation system. Available in Queen, California King and King sizes. Available in 4-piece and 5-piece sets. SAVE when you order a 4-Piece or 5-Piece Set! The Grand Bahama 4-Piece Set includes: Flotation System, Bed, Dresser, Mirror, Night Stand. The Grand Bahama 5-Piece Set includes: Flotation System, Bed, Dresser, Mirror, Night Stand and Chest. The Grand Bahama Flotation 4 Piece Set Includes: Complete Flotation System, Dresser, Mirror and one Nightstand. The Grand Bahama Flotation 5 Piece Set Includes: Complete Flotation System, Chest, Dresser, Mirror and One Nightstand. The Grand Bahama Flotation System Includes: Poster Bed with full depth 8" mattress and foundation for a complete flotation system. Matching furniture available. 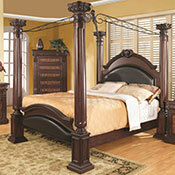 The Grand Bahama Flotation Bed Includes: Poster Bed with upholstered panels, large posts and black metal scrolled top. Matching furniture available. (Mattress not included). 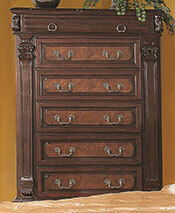 The Grand Bahama Tall Chest with 5 Drawers. 41" x 19"D x 53.5"H.
The Grand Bahama 9 Drawer Dresser with 3 Felt-Lined Drawers. 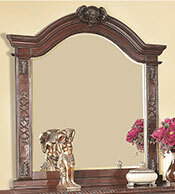 19"W x 64"D x 38"H.
The Grand Bahama Dresser Mirror. 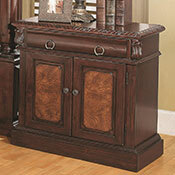 45"W x 3.5"D x 50.5"H.
The Grand Bahama Nightstand with 2 Doors 31" W x 18"D x 31"H.